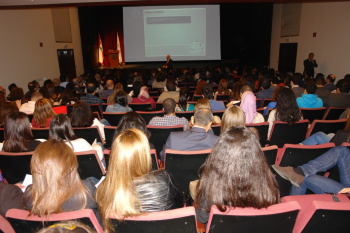 The Alumni Relations Office organized a lecture by Dr. Raed Mohsen entitled “The Art of Communication at the Workplace: Your Key to Success” on Friday November 30, 2012 at Irwin Hall theatre. Dr. Mohsen is specialized in human communication and marital and family therapy and is currently the Dean of Students at LAU Beirut. Over 260 alumni and friends attended the event which was followed by a reception.